After a 30-year drought, it was only a matter of time before “Northeastern University: Tournament Champions” was affixed onto the Beanpot banner that hangs in the TD Garden rafters. Behind three goals from junior forward Adam Gaudette, the leading goal-scorer in the nation, No. 12 Northeastern University captured its first Beanpot title since 1988 with a 5-2 win over the No. 20 Boston University men’s hockey team Monday night in the same building that saw Boston Celtics legend Paul Pierce get his number retired 24 hours earlier. The Huskies’ (17-8-5, 11-6-3 Hockey East) victory upped their record to 3-0 on the season against the Terriers (15-12-3, 10-7-3 Hockey East). The Gaudette hat trick gave the Braintree native 24 for the season while senior forward Dylan Sikura upped his second nation-leading assist total to 27 with two dimes on the day. The Huskies’ freshman goaltender Cayden Primeau faced 40 shots but was unfazed, blocking out all but two. 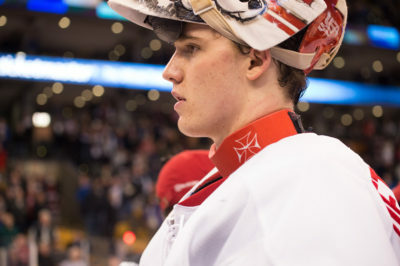 On the other side of the ice, BU sophomore goaltender Jake Oettinger made 22 saves on 27 shots as the Huskies went 3-for-3 on their power play. After graduate transfer forward Drew Melanson cleaned up a shot by freshman forward Brady Tkachuk on Primeau’s left pad and tucked it into the net, BU appeared to have garnered the early lead. However, the goal was nullified due to goaltender interference. But the Terriers would get their satisfaction 12:35 in the first. After a feed from freshman forward Hank Crone, classmate freshman forward Logan Cockerill controlled the puck behind the net. Attempting to pass it to freshman forward Shane Bowers, Cockerill was able to bounce the puck off Primeau’s stick. The goalie failed to corral it, and it trickled into the cage for Cockerill’s fifth goal of the season. The lead would not last long. With 5:22 remaining in the frame, Huskies’ senior forward Nolan Stevens took a feed from sophomore defenseman Jeremy Davies and freshman forward Zach Solow, and toe-dragged his way past sophomore defenseman Chad Krys. Stevens then pushed the puck past Oettinger to knot up the contest for his fifth goal against the Terriers this season. Not even three minutes had passed before Northeastern gained a one-goal buffer. After BU senior forward Chase Phelps was saddled with an interference penalty, the Huskies made their counterparts pay. Gaudette set up shop in the left slot and when a ricochet from Sikura came his way, he ripped it past Oettinger. The avalanche continued into the second period. With 5:28 remaining in the stanza, Northeastern doubled the gap between the two sides. Third-line senior defenseman Trevor Owens took a cross-ice feed from freshman forward Austin Goldstein and sliced it past Oettinger for his second goal of the year. Tkachuk went to the penalty box with 34.4 seconds left in the frame, putting the Terriers in a precarious position, and the Huskies wasted little time. Sikura wove a feed through BU senior defenseman and captain Brandon Hickey’s legs from the right slot to the left slot. Gaudette gripped it and ripped it off the heel of Oettinger and into the net with 3.5 seconds left on the clock for his 23rd tally of the year and Northeastern’s third power-play goal of the night. The Terriers decided to pull Oettinger from the net with 4:30 remaining in the contest, and the offense obliged. Bowers tipped a puck through Primeau’s pads with 2:40 to go to slice the deficit to 4-2 off an assist from Cockerill. However, Northeastern would get the last laugh. With 33 seconds to go, Gaudette clinched the hat trick. He beat Krys down the ice for a loose puck before putting on the breaks and whipping the rubber into the back of the net to send the Huskies’ fan section into a certified frenzy.